New Mexico’s most iconic story, interpreted for the big screen. to slip from between the lips of a dozen members of the cast and crew. From the starstruck atmosphere, one would have thought a Brad Pitt or Matt Damon was about to make a cameo in the film being shot here today. Instead, the figure who emerged onto the set wore a conservative V-neck sweater over a sky - blue shirt, slacks, and sneakers. His hair and moustache were a soft, silvery gray. But the normality of his appearance did nothing to diminish his aura. The bemused visitor was Rudolfo Anaya, author of the quintessential novel of New Mexico magical realism: Bless Me, Ultima. The book, published in 1972, is Anaya’s semi-autobiographical story of growing up in rural northeastern New Mexico in the l940s. It draws from real events in Anaya’s life, and from New Mexico cuentos (folktales) that are rich in witchcraft, animals, and magic. The tale is told through the youthful eyes of Antonio, the author’s alter ego. When Antonio is six years old, Ultima, the woman who delivered him and buried his afterbirth, comes to live with his traditional Catholic family. With her deep knowledge of herbs and healing, Ultima is somewhere between a curandera (folk healer) and a shaman.The connection between the boy and the elderly Ultima is profound. Forty years after the book’s publication,an adaptation has finally been filmed under the direction of Carl Franklin, a veteran actor, writer, and director best known for helming Devil in a Blue Dress, with Denzel Washington. Working with a cast and crew from Los Angeles, New York, and New Mexico, Franklin undertook the daunting task of translating one of the state’s most beloved pieces of literature into film. The production schedule led the troupe from Ruby Ranch in Sapello, to Romero Farms in Alcalde, to Rowe’s Pecos River Ranch, and to Merced del Pueblo Abiquiú. These locations stood in for Santa Rosa and environs, where Anaya grew up and where the story is set. 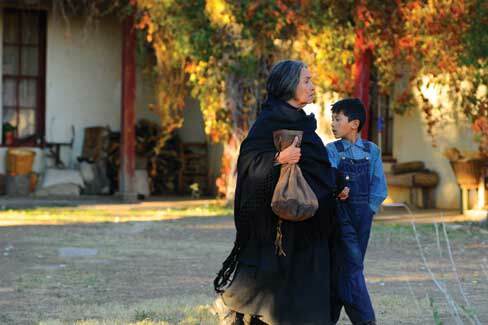 The film premiered in New Mexico October 17, at the Santa Fe Independent Film Festival; its producers hope it will soon be in a wide release throughout the state. With Anaya’s blessing, Franklin cast the indie film with little-known actors, and shot it on a modest budget (by Hollywood standards) of about $11 million. A Rudolfo Anaya blessing comes in many forms. Judith Fein is a Santa Fe–based travel writer and author of Life Is a Trip.